The health burden of smoking tobacco is well documented and it is known to kill more than half its users. Nurses have a pivotal role in promoting smoking cessation and this is going to be even more important in the current financial climate because of the economic burden placed on health and social care. This article will discuss integrating brief intervention advice into clinical practice, and provide useful training resources that are available to upskill nurses and other healthcare professionals. 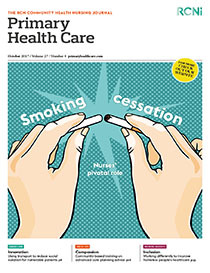 It will explain smoking cessation treatment and outline the support required to help people successfully quit.